"Audit: Bush Barely Trims FOIA Backlog"
"Backlog of data requests still bulging"
"Audit finds more than 200K public-records requests unanswered"
The order set up Chief FOIA Officers at each of 90 federal agencies and asked for FOIA improvement plans from each agency. The Archive’s Survey, the seventh in a series of unprecedented government-wide audits of FOIA performance, analyzed all the agency improvement plans, sent FOIA requests to all 90 agencies (plus 18 major agency components), and queried agency FOIA Service Centers and public liaison offices to test responsiveness. The Knight Survey found across-the-board improvements in customer service for FOIA requesters based on the establishment of FOIA service centers, public liaisons, and chief FOIA officers as readily identifiable contacts for requesters across agencies. But the survey found uneven progress and outright shortfalls on the problem of backlogs, because the order lacked any enforcement mechanisms or funding, and left goal-setting up to the agencies themselves. Two years into implementation of the order, the number of pending FOIA requests government-wide remains in the range of 200,000, with large variations between agencies, according to the Survey’s analysis of agency plans and reports. According to the Survey, for example, the FBI failed to meet many of its self-imposed goals for backlog reduction and resorted to moving the goalposts instead. Rather than actually processing requests, Treasury shifted the burden onto requesters with a series of letters demanding quick responses of continuing interest, and kept sending the letters even after requesters responded. President Bush’s order also prompted only limited improvement in compliance with the 1996 E-FOIA amendments, which require federal agencies to post certain records and FOIA guidance online. Of the 12 worst agencies identified in an earlier Archive survey of agency Web sites, only one-third showed significant improvement, while 42% of these “e-delinquents” made no apparent changes to bring their deficient sites into compliance with the law. “The order was only a small step for open government,” remarked Meredith Fuchs, general counsel of the National Security Archive. “There are certainly mixed messages when the President asks for results under the Freedom of Information Act, and at the same time refuses to support funding of technology or personnel, opposes improvements to the law, and exempts parts of the Executive Office of the President from the law.” In FOIA litigation involving the White House Office of Administration, the Office of Administration in 2007 began to claim that, despite processing FOIAs in the past, filing FOIA reports for Congress, and writing a FOIA improvement plan, it is not subject to FOIA. Two years after the executive order, Congress ultimately passed – and the president signed – FOI amendments. These amendments impose mandatory reforms on agency FOIA programs and include penalties and other enforcement mechanisms, and set up an ombudsman office at the National Archives and Records Administration. In his recent budget proposal, President Bush eliminated the budget for this office and shifted its responsibilities to the Department of Justice, which represents agencies in court against FOIA requesters. “Freedom of information laws exist to provide American citizens with the facts they need to run their governments and their lives. Information may seem more plentiful these days, but that doesn’t mean it’s less important. Strong democracies are held together by the force of their facts,” said Eric Newton, vice president of the journalism program at the John S. and James L. Knight Foundation, funder of the Knight Open Government Survey. 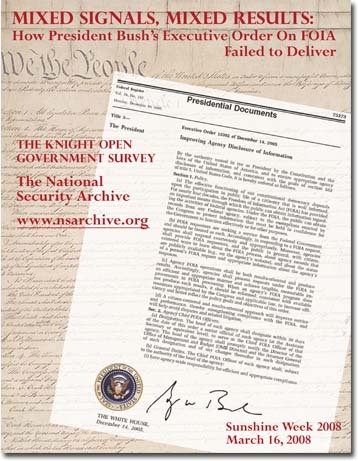 The Emmy-and George Polk Award-winning National Security Archive at The George Washington University has carried out six previous government-wide audits of FOIA performance over the last five years, compelling some agencies to clean up their backlogs of oldest requests and prompting multiple Congressional hearings and the passage of important amendments to FOIA procedures in the OPEN Government Act of 2007. The John S. and James L. Knight Foundation promotes journalism excellence worldwide and invests in the vitality of the U.S. communities where the Knight brothers owned newspapers. Since 1950 the foundation has granted more than $300 million to advance journalism quality and the freedom of expression.